Roadway crashes are the leading cause of occupational fatalities. 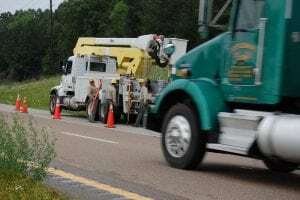 The Tennessee Department of Safety reports that each year, more than 100 highway and street construction workers die because of vehicle crashes or equipment accidents on the job. Another 20,000 are injured in those incidents. 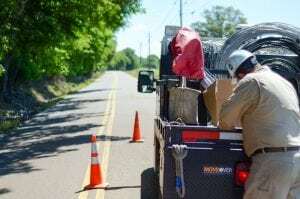 Tennessee’s “move-over” law creates a safety zone to protect police, firefighters and other emergency personnel, as well as utility service equipment, highway maintenance vehicles and stationary recovery vehicles (wreckers). Motorists are required to either slow down or move over when these vehicles are properly marked and parked on the side of the road. If safety and traffic conditions allow, a driver approaching a utility vehicle with flashing lights should move into the far lane. If changing lanes is not possible, a driver should reduce speed when approaching a utility vehicle with flashing lights. In January of 2006 Tommy Campbell, an employee of Duck River Electric Membership Corporation, was struck by a vehicle in Decherd, Tenn. Tommy was thrown onto the hood and windshield of the car and then up into the air. Help us spread the word. Order Move Over bumper stickers for your personal vehicle or fleet. Tennessee’s Move Over law was extended to protect work zones of utility workers in 2011. You can learn more about the Move Over law at moveoveramerica.com. The Move Over Tennessee campaign is a partnership of the Tennessee Electric Cooperative Association, the Tennessee Municipal Electric Power Association and Tennessee utilities.